A TOP SELLING ITEM and a NEW PATTERN!! A Super Sweet fleece construction on this massive hoodie. Dual large front zipped pockets on each side enter a huge hand-warmer and cargo area up front. You could keep a turkey in there! Also, a "napoleon" chest pocket for easy-to-get-to items. Quarter zipped, dual drawcords on lined hoodie, and drawcord and bell lock at waist. Soft, supple wrists, and the BEST PART - IT FITS! We know because we made it! 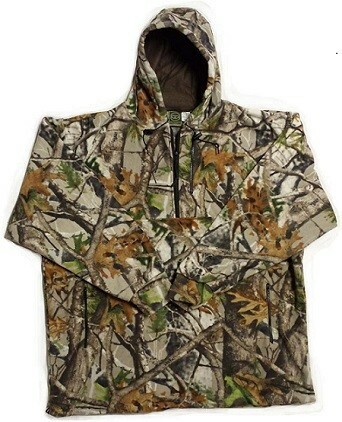 Sizing TIP: The 4XL is 34.5" long down the back, and has a chest of 67", sleeves of 40+". Each size up is another 4" through the chest, and a hair longer down the back. THANKS! Super equipment - This is our best-selling fleece item, and we were lucky to get a little VISTA to sell through. Works like APG, AP or Break Up. Plus, it's just good looking!